If you are looking for a funny party game to have a nice evening with your friends, come closer and have a look at “At Sundown“. With this one, we have a top down shooter, developed by “Mild Beast Games“ and published by “Versus Evil“. Actually we have a quite special game here, cause it is one of the first games, which run over the platform “Discord”. Discord is trying to become… No, it became a universal platform for gamers. Up to four players watch the map from above and everybody controls one fighter. The main parts of the maps are dark and make the figures invisible. That’s where it becomes interesting. You watch the map and move your fighter. Nobody knows, where the others hide, until you shoot, run or become visible in enlightened areas. Remember positions of your enemies and pay attention to every movement. It decides between life and death! You are able to choose between four different fighters, who can be armed with five different weapons so far. If you take the SMG, Sniper Rifle, Auto rifle, shotgun or revolver, is your decision, but you can change weapons after every death. So don’t be shy and try them all. Every weapon has some special abilities and different secondary equipment, to surprise your opponent and keep the fight diversified. The sniper rifle for example can shoot through the whole map and has remote-controlled bombs, which can be placed everywhere. By that you can keep the short-range guns on distance and that is really necessary, because one-hits kill and if a shotgun or SMG fighter has you on target, you are as good as dead, if there is no plan b. Their maxim is spray and pray, because they are unbelievable killing machines on close range. If you know how to control your figure, you can be everywhere on the battlefield and running a glorious killing-spree. To stop those sprees, there are collectable power ups like the plasma canon or a giant sword. Nice gadgets to balance the game. But since not everybody wants to be thrown into the cold water, you can do some warm up rounds in the tutorials. It takes some time to become friend with the movement and gun handling. You get to know every weapon and their most effective ways to kill, by including the secondary weapons as well. However, you are not yet playing on the main maps where the actual battles take place. Bit by bit we approach the seriousness of life… oh, wrong topic… the seriousness of gaming. The next, more challenging level, is the fight against bots on one of the main maps. You choose and customize the map settings and the fun begins. The bots are semi pros and not easy snacks for a newbie. Those rounds are nice to get familiar to different maps. You learn where and how to walk, being unseen. Never think that would be easy peasy lemons squeezy, cause its actually difficult difficult lemon difficult. I already told you a lot about the possibilities to customize every round in a different way. You can change the game time, how many kills you need to win or if you want to include power ups. All in one, the general settings, but it’s not just about those parts. The most important point for customization is, already at the beginning it is possible to choose between many different maps. They have a lot different features, like traps which can ruin your current tactic. At first there are three maps and they can be organized in four ways. By reaching a new level, you will unlock new ones. It’s that easy. Sniping over the whole map is no problem for you, but for others. Furthermore it is not just for local multiplayer how I told you in the beginning. For sure you can find yourself three mates and connect four controllers, so you can do your own championship, but the devs also included an online multiplayer. So here we have the supreme discipline. As always, human players have a different, higher or none skill in PC games, so you get some new challenges to dominate or getting destroyed. Anyhow a nice pastime for the free time. 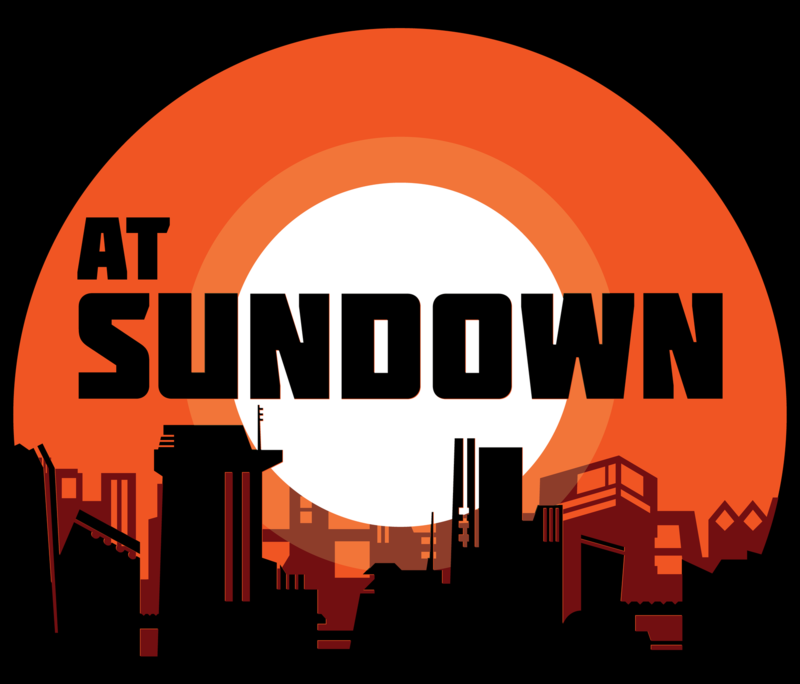 “At Sundown” is a fast and chaotic top-down shooter, but in the same second very entertaining. As long as you are not going to play one on ones, for the whole night and catch up with more players, you will not regret your purchase.